Underground Energy performed a hydrogeologic study to assess the Chicot Aquifer for potential use as a source of water supply for a proposed LNG liquefaction terminal. Initially, a desktop hydrogeologic study was performed to qualitatively assess hydrogeologic affects from development of a groundwater source to meet the Project’s average operational water supply requirement, either from an on-Site supply well or from expansion of the municipal waterworks system. Permitting requirements and timeframes were evaluated for both groundwater and surface water withdrawals to meet the projected operational needs of the LNG terminal. The Chicot aquifer system is the principal source of fresh groundwater in southwestern Louisiana, and it is the only groundwater source that could supply the Project, either directly via on-Site wells or indirectly via an expansion of the municipal waterworks system. Salinity in this coastal aquifer increases with depth and with proximity to the Gulf. 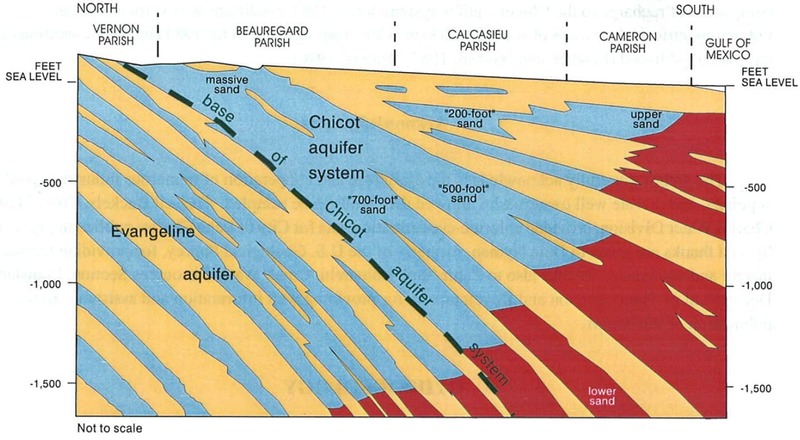 The upper Chicot aquifer is highly transmissive and has sufficient hydraulic ability to support a new groundwater supply. When the hydraulic effects of an on-Site groundwater source were compared to increased pumping from the municipal wells, our analysis indicated that development of an on-Site supply could potentially serve as a hydraulic barrier between the municipal wells and more saline groundwater. The next phase of the project involved the installation of a test well to assess onsite groundwater conditions and to facilitate supply well design. A boring was installed into the upper Chicot aquifer, soil samples were collected for grain-size analysis, and the hole was logged using electric and gamma geophysical tools. 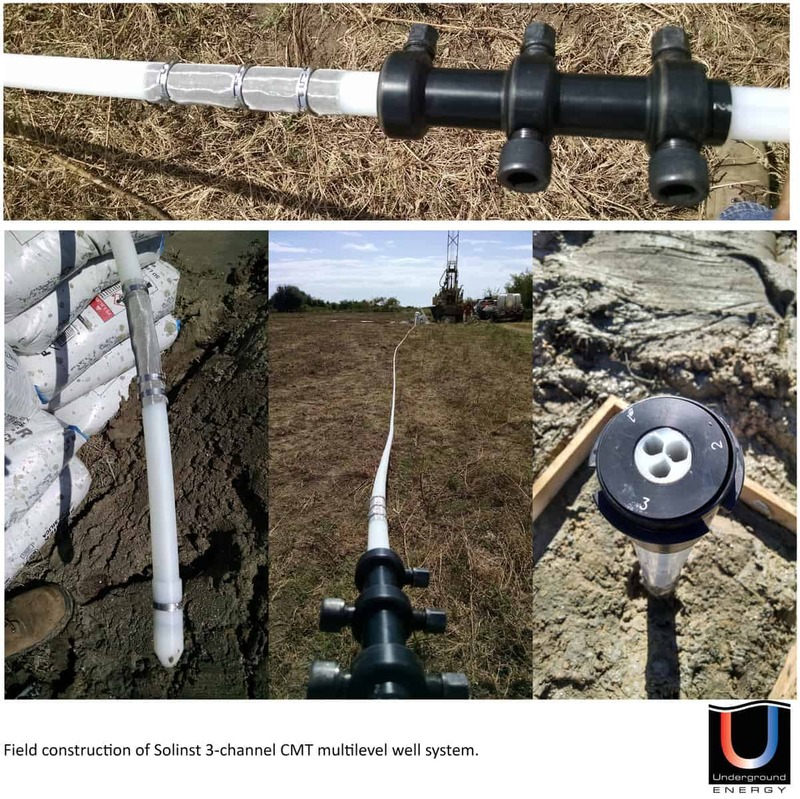 Based on field interpretation of the logs, Underground Energy designed and constructed a Solinst® CMT Multilevel System with three sample ports installed at discrete depths in the aquifer. Hydraulic and water quality measurements were made from these three ports to evaluate hydraulic head, vertical hydraulic gradients and the vertical distribution of salinity within this portion of the aquifer. The multilevel well can be used for groundwater monitoring during future pumping tests of production wells, and for a long-term, onsite monitoring. Installation of Solinst Continuous Multichannel Tubing (CMT) test well after geophysical borehole logging. A preliminary design recommendation for a groundwater supply well was provided based on the field testing.